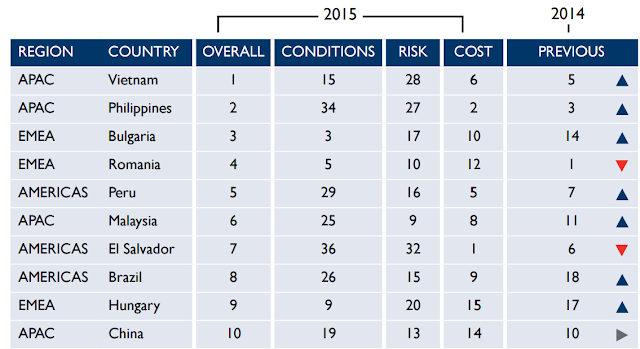 Philippines Remain as one of the Top Destination for BPO and Shared Services in the World. The Philippines has strengthened its position as one of the top destination for BPO and Shared Services in the World. The country was ranked 3rd for 2014 and 2nd for 2015 up by one notch this was according to a report by US-based global real estate adviser Cushman & Wakefield entitled “Where in the World? 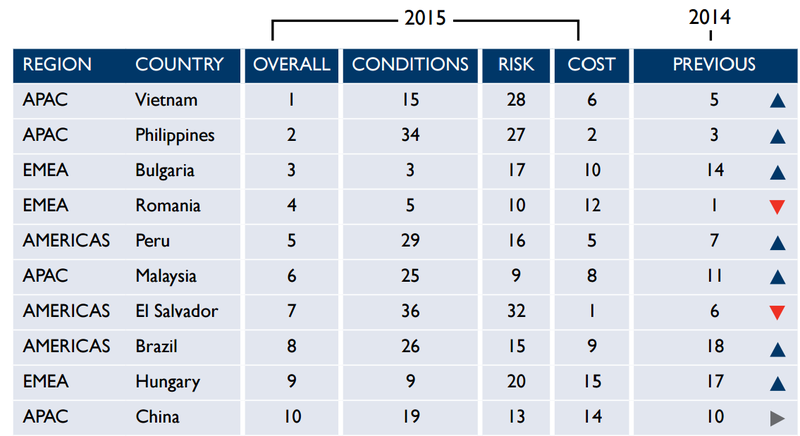 Business Process Outsourcing and Shared Service Location Index 2015”. 1. Conditions 30 % – conditions like IT infrastructure, education and English proficiency. 2. Risk 20% – the risk factors include economic stability, political stability, corruption perception index, and energy security. 3. Costs 50 % - cost of labor, building costs, inflation, and property cost. Below is the top 10 list, lower number is better. With government support and better IT infrastructure Vietnam was able to climb on the top spot overtaking the Philippines. Based on the data the Philippines is attractive to BPO Investors because of its cheap labor and low property cost. Philippines could go for the top spot if the government would make a move to improve the IT infrastructure (internet connection) of the country because it’s one of worst in the world. Based on the report by Netindex the Philippines has an average internet speed of 3.6Mbps which put us at the 176th place in the world and at 21st place when compared to other Asian countries. According to BSP (Bangko Sentral ng Pilipinas) the BPO industry will overtake the remittances sent by OFW’s as the main source of dollar income within the decade. If the BPO Industry would be the leading source of dollar remittance, it may be the right for the government to create an organization that would protect the welfare of BPO employees. This is to ensure that call center companies would be in compliance with labor laws. The created agency may also provide assistance to employees who lost their jobs due to retrenchment or account pullout. If you look at our list of cases filed against BPO companies, most of it are caused by illegal dismissal. Few years ago Vietnam trained in the Philippines to enhance their knowledge on rice farming. With proper government support, the end result was clear; we are now importing rice from Vietnam. I hope that the BPO Industry would not suffer the same fate same as the rice industry, where lack of local talents and less government support may prompt BPO companies to outsource the jobs elsewhere.